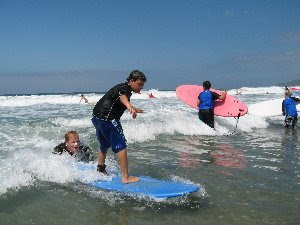 Learn to surf at Aloha Beach Camp in Los Angeles for kids and teens ages 4 to 15! We're a Billabong surf camp in Malibu, so you know you're gonna get quality instruction, dynamic curriculum, a safety-first attitude and all the insane Billabong gear you’d expect from the leader in board sports. Aloha Beach Camp's Malibu Billabong Surf Camp presents surfing as a lifestyle, covering water safety, ocean science, environmental awareness surf, etiquette and cultural heritage. Top it off with unreal Billabong surprises, from giveaways to special appearances from Billabong pros and you have the most complete “learn to surf” program available coast to coast. Visit Aloha Beach Camp online for more info today!